The board originally comes with a table of sizes, which unfortunately is not always useful if you make non-standard size cards (happens a lot to me! :) Moreover, there is no mention of any boxes that actually can also be made using this board. So, my dear husband made me this simple any size envelope/box calculator. Thank you Honey! 3) a card with fluffy 3D flowers is better off with a box. Use metric or imperial to specify the size of your card. Punch Point gives you the first punch/score point. wow thank you!!! I've been pulling my hair out trying to work out envelope sizes and this worked perfectly! Straight to the bookmark list! Thank you, Em! Happy to help! OMG, I just bought the 1, 2, 3 to make soap boxes and was starting to go insane!!! Thank you! This is brilliant! thanks so much to you and your hubby! So happy it worked for you, too! Thank you! I will use this to make storage envelopes for 8.5"x14" papers. Just found your blog doing a search on metric - not for me but for a crafting friend that asked me if the envelope Punch Board would do metric - this is an amazing program your hubby developed - I will give it a try - love my Envelope Punch Board - never made a box with it - but will try - I also just purchased the mini envelope punch board - these are both fabulous tools that I enjoy using [PS I was blessed to WIN the first one and blessed to win a GC to purchase the mini one] have a lovely week and thanks! You are very welcome! And a nice week to you and your crafting friend, too! Thankyou so much for this! It is amazing and so very much appreciated! Thank you for offering this. Is there a way to use this generator to get an exact size? I have used the measurements on the envelope tool itself, on the AC's generator and with custom measurements from AC itself and I simply cannot get the size envelope I want. The same size as a commercially made A2 envelope. Here's the problem: I want to use commercially made clear -sleeves and -boxes for presentation. Either the envelope is too big (most of the time) to fit in a sleeve, or too small for the card. I've tried fudging measurements by 1/16 of an inch at a time. I've made 30 envelopes just trying to get the exact size of a commercial envelope and I've come up empty handed. I'm about to lose my mind and wanted these for Mother's Day. Any ideas for how I can conquer this task? Thanks. Hello, L BT! You may try to use my calculator to meet your purpose by selecting the _1_layer_card_ option and entering the size values 1/16" smaller than the desired envelope size. Do you mean A2 (4 3/8 x 5 3/4)? I've just tried 4 5/16 x 5 11/16 as the "card" size and it produced an A2 envelope. Hope it helps! WOW....amazing tool, I have just made the perfect box to house my lucky bridal sixpence for my daughters wedding! Thank you for sharing! WOW!!! Grazie grazie grazie!!! Thank you Thank you Thank you!!! This is excellent! Thank you so much for posting this! I just made the perfect sized envelope. I have the new envelope punch board - white with gold print - and I can't read the numbers. My eyes are not good enough. Your calculator is so helpful. Thank You! You're simply the BEST! Glad you find it useful! As to an iOS version... Not in the near future, I'm afraid. Primarily because we don't have a single Apple device in our house! Sorry! For a _flat_ 1 layer card size 4 1/8 x 4 1/8, you have to use a _square_ sheet of paper sized 6 11/16". 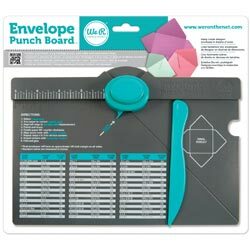 Use it on the envelope making board by placing the top left hand corner where the measuring scale is at 3 3/8". Hold the paper in this position, score where the scoring line lies and punch. Turn the paper 90* and proceed according to the WE R Memory Keepers instructions. Score and punch all the 4 sides of the paper. If the card is not flat, select the "Thick Card" option in my calculator. how do I make a lid? I need a box 6x6x1 with a lid can you help? Unfortunately, the We R Memory Keepers board is not meant for "pizza" style boxes. The box that it makes is similar to an envelope, a thick 3-d envelope. The Scor Pal and similar scoring boards are usually used for more traditional types of boxes. They also usually have manuals about how to use the boards for making boxes. Or you can look up online, but for the Scor Pal, not the We R Memory Envelope board. Thank you! Thank you! This is awesome. I'll be sharing your information on my blog soon. Thank you so much for this. The calculations work perfectly. A Godsend!! Thank you so much for this. The measurements work perfectly. Absolutely BRILLIANT! !